The term “design thinking” is often attached to maker spaces and STEM labs. However, design thinking is bigger than STEM. It begins with the premise of tapping into student curiosity and allowing them to create, test and re-create until they eventually ship what they made to a real audience (sometimes global but often local). Design thinking isn’t a subject or a topic or a class. It’s more of way of solving problems that encourages risk-taking and creativity. Design thinking is a flexible framework for getting the most out of the creative process. It is used in the arts, in engineering, in the corporate world, and in social and civic spaces. You can use it in every subject with every age group. It works when creating digital content or when building things with duct tape and cardboard. For the last 12 years, I’ve used design thinking. As a teacher, I used it for everything from coding projects to service projects to documentaries to engineering challenges. As startup co-founder, we used the design thinking cycle for product development. As an author, it’s a framework I use for publishing. 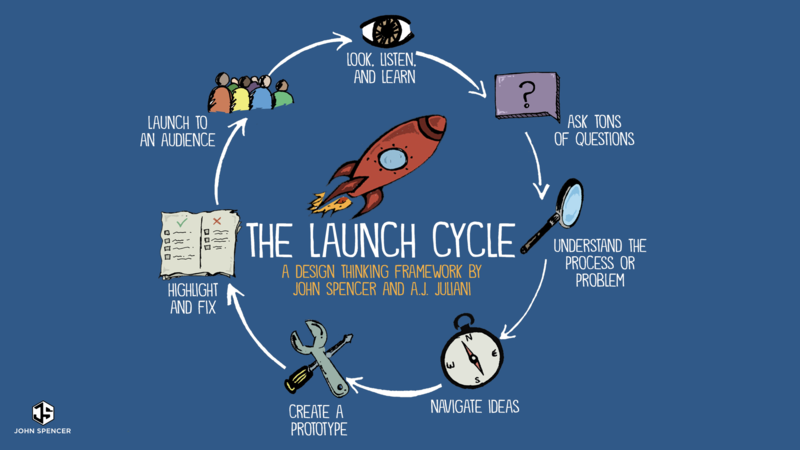 So, here’s a description of the design thinking cycle that AJ Juliani and I developed in anticipation for our upcoming book Launch: Using Design Thinking to Boost Creativity and Bring Out the Maker in All Students . Note that we added a final phase that’s often missing from design thinking models. It’s the idea of launching. It’s the belief that after students have designed their work, they should send it to an authentic audience. Sparked by curiosity, students move to the second phase, where they ask tons of questions. This leads to understanding the process or problem through an authentic research experience. They might conduct interviews or needs assessments, research articles, watch videos, or analyze data. Next, they begin to highlight what’s working and fix what’s failing. The goal here is to view this revision process as an experiment full of iterations, where every mistake takes them closer to success. Looks great John. I like your ideas. I was wondering if your Launch Cycle has a CC license to reuse (credit will be given to you of course)? We are interested in using it at our school. You bet! I’d be honored.